More than 1,000 students took to the dance floor at the BMO Harris Bradley Center for the spring Mad Hot Ballroom dance competition, showing off their best moves in salsa, tango and swing styles. Teams of young dancers clustered into their assigned areas on the concrete dance floor before each performance. They appeared to be full of nervous energy as they waited, fidgeting with their sparkly bowties, fluffing their tutus, and exchanging grins with their partners. Once the music started, the dancers burst into well-practiced routines, looking happy and at ease. Alyssa Pon-Franklin, a volunteer at the event, said the program provides a unique opportunity. The program started in New York City and is the subject of the 2005 documentary, “Mad Hot Ballroom.” Milwaukee’s Danceworks picked up the program in 2006. Mad Hot Ballroom is meant to bolster the arts education in urban schools’ curriculums. In addition to dance, the program teaches teamwork, goal-setting, respect and the importance of exercise. The competition culminated an 11-week program in which classrooms at 50 schools partnered with a Danceworks instructor. Brinkman said the kids are usually tentative about the program in the beginning. A panel of judges chose winners for each dance style based on attitude and energy. MacDowell Montessori School won first place for salsa, Gilbert Stuart Elementary for tango and Byron Kilbourn Elementary for swing. There was also an overall award, which went to Riley Elementary. All of the winning schools were Milwaukee Public Schools; some Milwaukee private schools also participated in the program. This was the 12th and possibly final year of the competition at the Bradley Center, as the building is set to be demolished later this year. According to Danceworks President and CEO Deborah Farris, the Bradley Center allowed Mad Hot Ballroom to use the facilities free of charge since the Milwaukee program began. Paul Jansen, Bradley Center vice president, told the audience that he was happy to open the facilities for Mad Hot Ballroom. 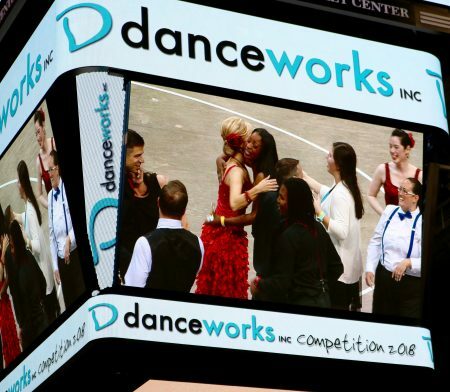 Many participants were saddened that there would be no more competitions at the Bradley Center, but the mood brightened when Marty Brooks, CEO of the Wisconsin Center District, told thousands of students and spectators that he would happily open the UW-Milwaukee Panther Arena for future Mad Hot Ballroom competitions. Ferris had parting words for the students. Terrific program and event for the dancers. They learn life skills while having fun. Good topic very well reported. Thanks.